It could be party time at Hayden Road tonight (Tuesday) as AFC Rushden & Diamonds look to wrap up automatic promotion in the Evo-Stik South League East. Diamonds will be promoted if they beat Aylesbury FC and third-placed Hartley Wintney fail to win at Kempston Rovers. However, even if both sides are victorious, Diamonds will still be able to toast elevation to Step Three as they are currently three points in front of and 15 goals better off than Hartley, who are now the only team who can stop Andy Peaks’ side. The mathematics are not something boss Peaks is concerning himself with. As far as he is concerned, if his players can pick up a fourth win in a row then the job they set out to do at the start of the season will be done. Having missed out in the play-offs in the last two years, an opportunity to get the job done without them has now arrived. And while Peaks knows there will be a big and expectant crowd on hand this evening, he insists “nothing is done” just yet. Diamonds got back on track with a 4-1 success over Aylesbury United and then followed it up with back-to-back 1-0 victories over AFC Dunstable and, at the weekend, Cambridge City. 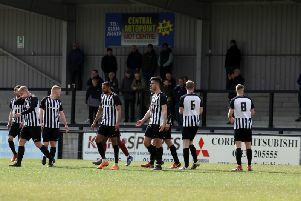 And, ahead of a huge night for the club, Peaks said: “I think the biggest win for us was the one against Aylesbury United because it got us back up and running. “I don’t think we stopped playing well during that run without a win but, in the last three games, we have defended solidly and when the chances have come in close matches, we have taken them. “We need one more win to be promoted and we will be doing all we can to get it tonight. It could be another great night for the club. “We had a superb following at Cambridge, it was great to see so many people coming out to support us and they helped push us on to another important victory. “I am sure there will be a big crowd out to watch us tonight. “But we have to remember that nothing is done, we just have everything in our hands. “I watched Aylesbury last Thursday and they were beating (second-placed) Beaconsfield for a long time so they are no mugs.